uicy Juice - “The very best juice for the very best kids” - was introduced in 1977 and is a brand of juices and juice concentrates geared toward children. 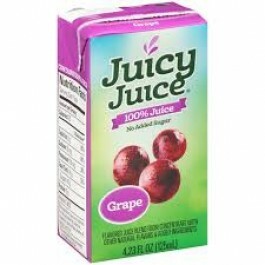 Juicy Juice Single Serve Grape Juice is made of 100% real grapes. Juicy Juice Single Serve Grape Juice offers a delicious sweetness and tartness that comes from juicy grapes. Contains no artificial sweeteners or flavors. It’s used in homes, bars, and restaurants to serve exotic drinks, cocktails, and mocktails. This product is a good source of Vitamin C. This product has a shelf life of approximately 365 days. Includes forty – 4.23 oz. bottles per case.